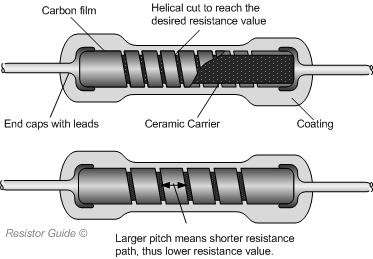 Carbon film resistors are made with a deposition process. At high temperature and under a high pressure, a ceramic carrier is held in hydrocarbon gas. The gas (methane or benzene) is cracked at a temperature of 1000°C. The crystalline carbon is pyrolytically deposited on the ceramic substrate. Because of the precise distribution of the pure graphite without binding, these carbon resistors have a low noise. The desired resistance value can be obtained by choosing the right layer thickness, and by cutting a spiral shape in the carbon layer. The helical cut in the film increases the length of the current path. By decreasing the pitch of the helix, the length of the resistive path increases, and therewith the resistance value increases. Furthermore, by fine tuning the cutting of the spiral the resistor can have a higher accuracy of resistance value. Typical tolerance values for carbon film resistors are 2, 5, 10 and 20%. Because of the use of pure carbon, the carbon film resistor has a higher negative temperature coefficient than carbon composition. The resistive temperature coefficient lies between 2.5×10^-4 Ω/°C and -8×10^-4 Ω/°C. Also this type of resistor is protected against chemical influences with a silicone coating. This type of resistor is widely used in electronics. Therefore it is important to note that the small resistors have a capacity of approximately 0.5 pF. 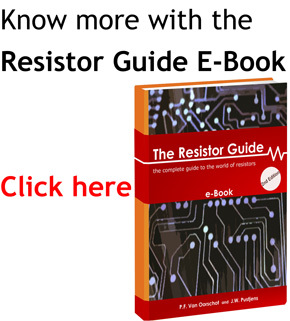 Self induction is around 0.01 μH for uncut resistors and up to several μH for spiral cut resistors. These resistors are available in values between 1Ω – 10’000 MΩ and have a power rating of 1/16, ⅛, ¼, ½, 1 or 2 watt.